Red Velvet Cheesecake Cake | Rosetta Bakes! What a great combination, red velvet cake and cheesecake in the same cake! Who ever thought of this combination I give them an A+! I absolutely love red velvet cake, and I’m also a big fan of cheesecake, so I had to give this recipe a try. I’ve been wanting to make this recipe for a while now, but pushed it aside because I had so many other recipes I wanted to post first. Recently one of the doctors at work ask if I thought I could make a cheesecake for her wedding, I thought cheesecake and wedding, wedding and cheesecake…hmmmm. I guess I was thinking a wedding should have a cake, that’s the typical thing you see at a wedding, but I told her I’d be happy to make it for her. Later on she hesitated and told me maybe her guests would like cake more. I suggested she think about it a few days and get back to me, and she agreed. I happened to remember this red velvet cake and cheesecake combination that I had put on the back burner and thought this cake would give her the best both worlds, cake and cheesecake! What a great idea…now if she agrees, we have a cake to make the bride happy…and her guests as well! When I showed her a picture of this cake/cheesecake combination, she thought it was perfect!! I was happy to finally make this cake/cheesecake, and she was happy to have them both in one cake! To be safe in making the cake for her wedding, I decided to do a test cake first and take it to work for my co-workers first, this way I would know first hand from my co-workers what they think of this cake. Well, I have to say, it was a winner, and a keeper! I’ll be making this recipe over and over and over for future events, it’s that good! I took her cake to work on Friday and she was very happy with the cake. I know she and her guests will be very surprised how beautiful the inside of this cake is. The red cake pops so bright against the white icing, and the cheesecake inside is an extra surprise. I will be making his cake for years to come. Preheat oven to 325 F. Heat a large pot of water to a rolling boil, or microwave and set aside while making the cheesecake. Set a 9-inch springform pan on top a sheet of parchment paper and draw a circle around the bottom of your pan with a pencil. Cut the circle out and place in the bottom of throughly greased springform pan, placing the pencil part down and smooth-out so there will be no air bubbles, and then grease again. Wrap the bottom of your pan with foil, then wrap again, crunching the foil up and around the sides. You will be sitting your springform pan in water, so this will assure no water will seep inside your cheesecake while it baking. In a bowl of an electric mixer, cream softened cheesecake until light and fluffy. Add the granulated sugar and cream well. With a wooden spoon, mix in the lemon zest, lemon juice and salt. Add eggs one at a time, mixing just until combines, but not over-mixed. Add the sour cream and flour to cheesecake mixture just until combined. Pour cheesecake mixture into your springform pan and smooth out top. Pour water into your pan and place the cheesecake pan lined with foil into the water making sure the water is half-way up the sides of your pan. If you feel more comfortable adding the water in the pan last when placing on your oven rack, it’s okay. The pan gets pretty heavy and if you’re not sure about moving the pan with the water to your oven, add the water while on the oven rack, being very careful to not burn yourself when doing this. Bake until the cheesecake is set, approximately 38 to 40 minutes. When cheesecake is done, set on a wire rack and run a knife around the sides to loosen from pan. Let cheesecake cool in the pan for about 20-30 minutes and then cover top with plastic wrap and place in the refrigerator over-night. Do not remove your cheesecake from the springform pan until the next day when you are ready to assemble cake. Lightly grease and lightly flour (2) 9″ inch cake pans and set aside. Cream shortening, sugars together, then add eggs one at a time and beat well. Make a paste of food coloring and cocoa and add to creamed mixture. Sift flour and salt together, and add vanilla to buttermilk. Add flour mixture and buttermilk mixture to creamed mixture (alternate). By hand stir in vanilla and soda, do not beat. Pour batter equally into cake pans and bake at 350 F for 25 to 30 minutes or until a toothpick inserted in middle comes out clean. Remove cakes for oven and cool on wire racks for 12 minutes and remove to wire rack to cool completely. If using parchment paper, be sure to remove from bottoms of cakes. *Note: if you want, you can line the bottoms of cake with parchment paper. Grease pan first, then place parchment paper in the bottom of baking pans and then grease again, then flour bottom and sides of pans. Once cakes have cooled, wrap with plastic wrap and refrigerate until ready to assemble the next day. Cream shortening until fluffy. Add confectioner sugar (2 cups at a time) until well blended. If frosting gets too thick, add some of your heavy whipping cream. Add salt, vanilla and the rest of your heavy whipping cream and mix until light and fluffy. If you like your frosting a little thicker, add less cream, if it’s too thick, add more whipping cream, not to exceed 2 Tablespoons. I would make the cheesecake and cakes the night before and assemble the next day. The next day you can make your frosting. First, layer the cakes on top of each other and apply a thin coating of frosting between the layers, and all around the sides of cake…this thin layer is called a “crumb coat.” Once you’ve applied your thin coat of frosting, refrigerate for 30 minutes. Once cake has chilled, you can frost your cake any way you like. I used roses, but you an frost anyway you like. Here is a link to my cream-cheese frosting, if you prefer this icing in place of what I have posted here. Cheesecake recipe from Erica at… ericaswettooth.com/2011/12/red-velvet-cheesecake-layer-cake.html. Red Velvet Cake: I’ve had for as long as I can remember! 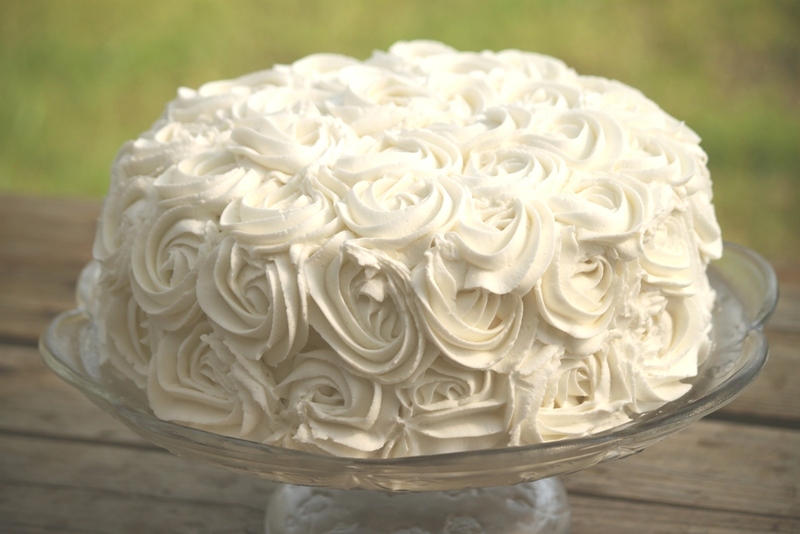 The Best Buttercream Frosting: I can’t remember where I got this recipe from! I AM BAKER is my baking idol!! This cake has so many steps to it but I am sure it is worth the trouble Looks amazing!! This looks delicious–I’ll have to try it soon! Just an FYI; I guess you use clear imitation vanilla and Crisco in the buttercream so it stays white, but there is a “whitener” you can buy with the cake colors. Real butter and vanilla make buttercream soooo much better! It’s a little more temperamental regarding temperature, as butter has a lower melting point, but you can sub back some shortening to help make it more temp-stable when you need to. I hope you’ll try it and love your buttercream even more! As much as I bake I never knew there is a whitener…but I’ll look for it. The buttercream icing for this recipe is from “Wilton. This is the only time I use imitation vanilla so the icing will stay white. Beth, now that I know there is a whitener, I’ll have to give it a try. I actually make my own vanilla Beth. I buy real vanilla beans and then a good vodka, then I open the vanilla beans and put the beans in the voldka…then the pods that I’ve opened up. It takes 2 months for it to be to be ready. When it starts to get a little low, I add more vodka. I use real vanilla in everything I make except this buttercream recipe. For a new baker…always use real butter and real vanilla, that’s what makes one cookie better than a cookie with margarine or imitation vanilla. Thanks Beth, I hope I can find it. I usually get my supplies at Michaels, Hobby Lobby, Jo Ann’s or Walmart. I used to think Jo Ann’s was just a fabric place but I was wrong the first time I went in. They have 3 to 4 isles of baking supplies…love going there. Thanks Beth for letting me know about the whitener! You’re very welcome, Rosetta! The whitener should be sold wherever the colors are sold. Wilton does make it, as do other brands. The Wilton one is what you’ll find where you say you shop–it’s a larger bottle than the little jars, and I believe it has a nozzle in the lid. It’s been a long time since I’ve looked for the Wilton brand of whitener. I buy the big bottles (something like 13 oz or so) when I can find them in cake decorating supply stores or online. When you make vanilla, do you leave the pods in while you use it or remove them once it’s ready? How do you judge the strength, to know how much to put in what you’re making? I’ve thought about making it, but am not sure how to keep it consistent over time.